Born around the time England was finally completely Christianized. Raised from age seven in the abbey of Saints Peter and Paul at Wearmouth-Jarrow, and lived there the rest of his life. Benedictine monk. Spiritual student of the founder, Saint Benedict Biscop. Ordained in 702 by Saint John of Beverley. Teacher and author, he wrote about history, rhetoric, mathematics, music, astronomy, poetry, grammar, philosophy, hagiography, homiletics, and Bible commentary. He was known as the most learned man of his day, and his writings started the idea of dating this era from the incarnation of Christ. 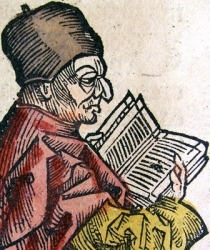 The central theme of Bede's Historia Ecclesiastica is of the Church using the power of its spiritual, doctrinal, and cultural unity to stamp out violence and barbarism. Our knowledge of England before the 8th century is mainly the result of Bede's writing. He was declared a Doctor of the Church on 13 November 1899 by Pope Leo XIII. Educated in Rome, Italy. Benedictine monk. Chaplain to Pope Gregory VI. In charge of the Patrimony of Saint Peter. Reformer and excellent administrator. Chosen the 152nd pope, but he declined the crown. Chief counselor to Pope Victor II, Pope Stephen IX, Pope Benedidct X, and Pope Nicholas II. 157th pope. At the time of his ascension, simony and a corrupt clergy threatened to destroy faith in the Church. Gregory took the throne as a reformer, and Emperor Henry IV promised to support him. Gregory suspended all clerics who had purchased their position, and ordered the return of all purchased church property. The corrupt clergy rebelled; Henry IV broke his promise, and promoted the rebels. Gregory responded by excommunicating anyone involved in lay investiture. He summoned Henry to Rome, but the emperor's supporters drove Gregory into exile. Henry installed the anti-pope Guibert of Ravenna, who was driven from Rome by Normans who supported Gregory; the Normans were, themselves, so out of control that the people of Rome drove out them and Gegory. The Pope then retreated to Salerno, Italy where he spent the remainder of his papacy. Catherine received a religious upbringing. 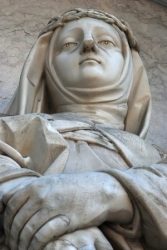 She was initially sent to a convent at age 14, but was taken back home by her family who opposed her religious vocation and wanted her to marry well. 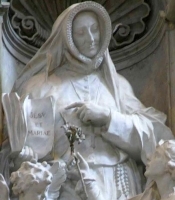 They eventually gave in, and Catherine became a Carmelite of the Ancient Observance at 16, taking the name Sister Mary Magdalen. Mystic. Led a hidden life of prayer and self-denial, praying particularly for the renewal of the Church and encouraging the sisters in holiness. Born to a farm family, and worked as a shepherd in his youth. He entered the seminary at 19, and served as parish priest at Totatiche, Mexico. Helped found schools, a newspaper, catechism centers for children and adults, carpentry shops, and an electric plant to power the mills. Worked with the indigenous people to form agrarian cooperatives with the town's people. Noted for his devotion to Our Lady. When the anti-Church government closed all seminaries, Father Cristobal gathered displaced seminarians, and started his own seminary; it was quickly suppressed. He formed another, and another, and when they were all closed, the seminarians conducted classes in private homes. He wrote and preached against armed rebellion, but was falsley accused of promoting the Cristero guerilla revolt. Arrested on 21 May 1927 while en route to celebrate Mass at a farm. In prison he gave away his few remaining possessions to his executioners, gave them absolution, and without a trial, he was martyred with Saint Agustin Caloca. Daughter of Jacques Barat, a cooper who worked with the vineyards for whom he supplied barrels. Naturally bright, she was educated by her older brother Louis, a monk. As Madeline grew older, her brother feared she would be exposed to too much of the world, and so brought her to Paris, France with him. The girl wanted to be a Carmelite lay sister, but with Father Joseph Varin and three other postulants, she founded the Society of the Sacred Heart on 21 November 1800; the Society is devoted to the Sacred Heart, and dedicated to teaching girls. Nun. Teacher. Superior General of the Society at age 23, she held the position for 63 years. Receiving papal approval of the Society in 1826, she founded 105 houses in many countries; Saint Rose Phillippine Duschene and four companions brought the Society to the United States. He was a tireless preacher - legend says that one sermon lasted so long that his staff took root and became a tree again. Spiritual writer known internationally in his day. One of the founders of Anglo-Latin poetry. A musician, he was skilled in the harp, fiddle and pipes, and known as a skilled and popular singer. 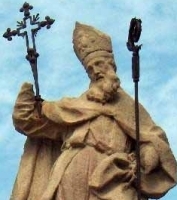 He travelled to Rome to meet with Pope Saint Sergius I and helped settle disputes on matters of theology and practice between the Celtic and Anglo-Saxon churches. Bishop of Sherborne from 705 until his death. Greek Catholic. Studied theology at the university of Lviv, Ukraine, graduating in 1923. Married with two sons and two daughters. Ordained on 5 April 1925. Parish priest at Soroka, Hrymailivsk deanery, where he built the church. Pastor of the Archeparchy of Lviv for the Ukrainians. Intimidated, then threatened, then beaten by Soviet authorities after World War II. Arrested for his faith on 28 October 1946; sentenced to ten years imprisonment on 27 January 1947, he was sentenced to ten years the forced labour camps in Mordovia, Russia. Died in prison, one of the Martyrs Killed Under Communist Regimes in Eastern Europe. Studied at the seminary in Guadalajara, Mexico until it was closed down by anti-clerical government forces. He resumed his studies in the covert Auxiliary Seminary of Our Lady of Guadalajara founded by Saint Cristobal Magallanes. Ordained on 5 August 1923. Prefect of the Auxiliary Seminary. Arrested for his continued religious work, and for unfounded suspicion of involvement in the armed Cristeros rebellion. Martyred with Saint Cristobal Magallanes. Born to the French nobility. Raised in a pious family; he was a Franciscan tertiary at age 5. Lived as a hermit in a cave with his brother from age 18 to 20. They became somewhat famous as holy men, which they took as a sign that they should become pilgrims in order to escape their visitors and the temptations that came with them. 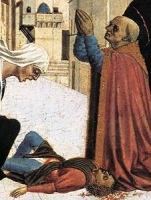 Gerard died on the way to Jerusalem. Miracles and healings have been reported at his tomb, especially helping people with headaches or epilepsy. Born to a poor family. Joined the Servites at age 9. Priest. Procurator of the Servite friary in Faenza, Italy until his death. Married layman catechist in the apostolic vicariate of North Cochinchina. Tortured and martyred in the persecutions of emperor Tu-Duc. Born a pagan, Zenobius converted and was baptized as an adult. Priest. Archdeacon. Friend of Saint Ambrose of Milan. Counselor to Pope Saint Damasus I. First bishop of Florence, Italy. Worked with Saint Eugene of Florence and Saint Crescentius. Fought Arianism. Miracle worker, reviving five people from the dead. Inspired by the example of Saint Francis of Assisi, Gerardo gave all his wealth to the poor and withdrew to live as a prayerful hermit. He came into the city for Mass, to pray in churches for the souls in Purgatory and the conversion of non-Christians, to care for the sick, and to offer any help he could give to pilgrims. Miracle worker. Well-educated Mercedarian friar. Chosen 15th Master-General of the Mercedarians in 1405, he worked to build up the interior life of its members, and the financial resources they used to ransom Christians from slavery in Muslim countries. Served as diplomat for the King of Aragon. Attended the Council of Perpignan, France; attended the Council of Constance, Switzerland. A great believer in the unity of the Church, he worked to overcome the Western Schism. Chosen bishop of Lyons, France, but declined. Layman catechist in the apostolic vicariate of West Tonkin (modern Vietnam). Martyred in the persecutions of emperor Tu Duc. Grandson of King Ismael of Granada of convert from Islam; son of Ozmin Aben Adriz a convert from Islam. Studied in Salamanca, Spain. Joined the Mercedarians in Valladolid, Spain. Commander of the convent of Córdoba, Spain for 13 years. Mercedarians provincial of Castile, Spain in 1407. Made redemption trips to Africa in 1415 and 1427 to ransom Christians who had been enslaved by Muslims. During the latter trip, he was imprisoned, tortured and executed by the Moors for refusing to deny Christianity. Martyr. Musu clan. Convert. One of the Martyrs of Uganda who died in the Mwangan persecutions. Bishop of Milan, Italy in 351. Exiled to Cappadocia in 355 by the Arian Emperor Constantius for defending Saint Athanasius of Alexandria. Born to the Catalan nobility. Joined the Mercedarians at age 18. Made redemption trips to Africa in 1415 and 1427 to ransom Christians who had been enslaved by Muslims. During the latter trip, he was imprisoned, tortured and executed by the Moors for refusing to deny Christianity. Martyr. Convert to Christianity. Bishop of a region of the North African coast. 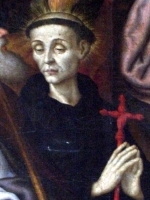 Brother of Saint Victorinus of Evreux. Missionary to Gaul, sent by Pope Damasus I. Martyr. Monk and abbot in Ireland. Abbot of Iona Abbey. Known for his personal piety and as a miracle worker. Married to Saint Injuriosus of Auvergne. The two, known as the Les Deux Amants, lived their lives together as holy and chaste lay people. Married to Saint Scholastica of Auvergne.The two, known as the Les Deux Amants, lived their lives together as holy and chaste lay people. Monk. Spiritual student of Saint Romanus. Abbot of Mantenay Abbey near Troyes, France. Abbot of Cornelimünster Abbey near Aachen, Germany. Killed by Viking raiders. One of a group of four martyrs executed together. No details about them have survived. Brother of Saint Maximus of Evreux. Missionary to Gaul, sent by Pope Damasus I. Martyr. Deacon at Saint Bertin Abbey. Murdered by invading Danes. Martyr. Monk of Saint Bertin Abbey. Murdered by invading Danes. Martyr.